For the past few days, we have not been receiving our points when doing Erubus. 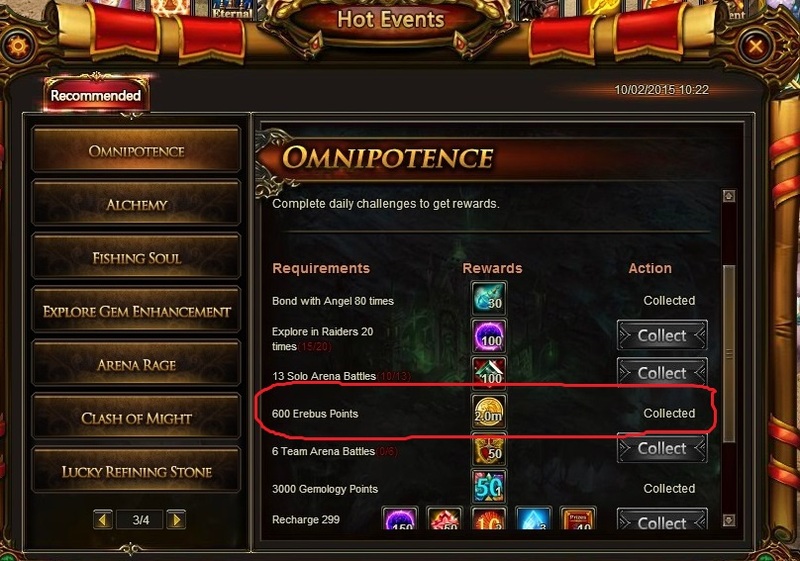 Check under Hot Events - Omnipotence and it will show you if you have received any points. I paid diamonds for extra tries yesterday and still got no points. Is anyone else having this issue? I tried to send a support ticket but it won\'t let me. Omnipotence erebus 0/600 will only filled if you reach 600 pts, otherwise it will stays 0. I am also having the same issue. What I would like to know, does the 600 have to be obtained in one attempt or the sum of all attempts added together? 1 paid diamonds for 4 extra blitzes yesterday in the amount of 30, 50, 150, and 750 to get the 600 points for Recharge History Bonus. I STILL didn\'t get any points showing for either. Thats 980 diamonds I paid for nothing. The 600 points needs to be obtained in a single Erebus Blitz...not all blitzes combined. As kross said, it was need in a single try. Erebus point will not be cumulative so even if you do 10x and all ends in 500, it will do nothing. To have guaranteed 600 pts, buy extra flip. Dear Player, congrats on your blitz however not every gives 600pts in blitzing erebus. 2019-4-24 07:03 GMT+8 , Processed in 0.061931 second(s), 52 queries .